Ask the Expert. . .How does Disaster Effect My Children? Ask the Expert… How does Disaster Effect My Children? Any type of disaster in the home usually leaves a profound negative impact on whomever was subject to the event. As an adult, disasters are stressful, but oftentimes adults are familiar with basic coping methods to help us through difficult times. Children, however, often suffer even more than adults because they’re unaware of how to cope with the aftermath of destruction. Gender also plays a role in how children cope. Girls tend to be more verbally expressive and ask questions about the disaster. Girls thoughts also dwell more on the event. Boys are more prone to being angry or violent and usually take longer to recover. All children often display signs and symptoms of Post-traumatic stress disorder or PTSD. Symptoms could include flashbacks of the event, nightmares, increased irritability, poor concentration, regression in younger children, depression, anxiety, or lack of interest in previously enjoyed activities. No matter how your child is expressing themselves after a traumatic event, it is important to talk to children before and after disasters. Talk to you child about disasters. Talk to them about what their worries and fears are. Teach children coping mechanisms such as taking a deep breath or discuss making a family emergency plan. Keep lines of communication open and praise your child for how brave or courageous they have been. 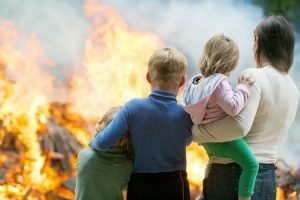 Telling your child disasters will never happen or that they won’t happen to your family could lead to trust issues and lack of confidence in parents if tragedy does strike. Pretending there is no danger does not help children. If you child has been victim to a disaster or traumatic event, consider seeking professional help if their behavior is not improving or to minimize the symptoms of PTSD. Talk to your child’s pediatrician and ask for a referral to a counselor or child psychiatrist or psychologist. Be sure to tend to your own wellbeing as children tend to identify with how parents deal with trauma. For your child’s comfort, seek to restore what you can from your normal routine. Even though it might not ever be what it was before, it will provide stability to children. remember to eat meals at regular times and enforce bedtime to help bring some amount of normalcy to your family. ARS Cleanup strives to get each family back into their home as soon as possible. As you tend to your family, we will take care of your home.